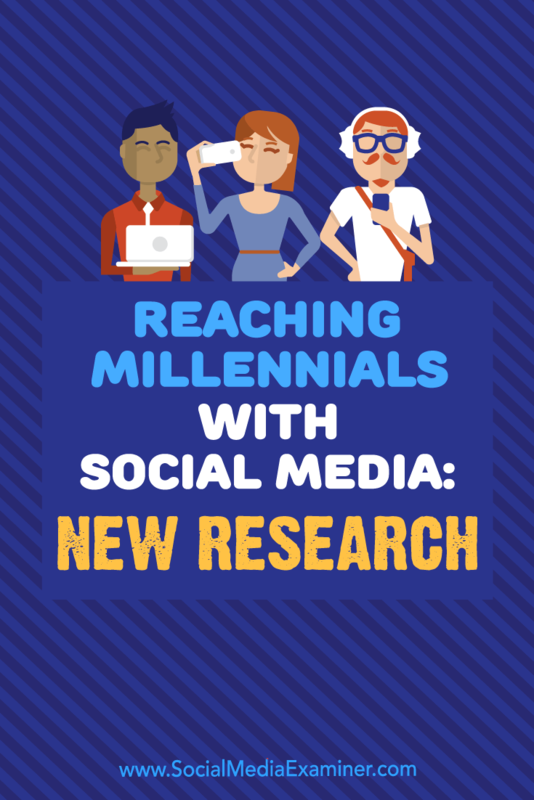 In this article, you’ll discover insights from new research you can use to get your social media messages in front of Millennials. 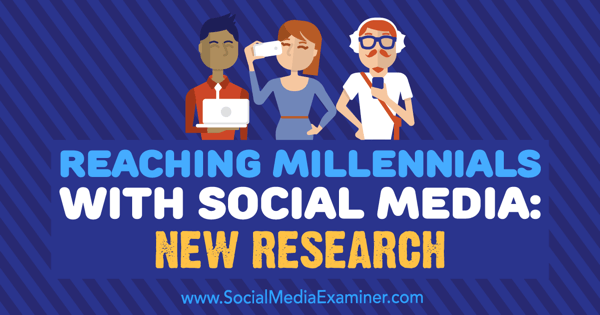 Reaching Millennials With Social Media: New Research by Michelle Krasniak on Social Media Examiner. Millennials, those individuals born between 1980 and 2000, make up 25% of the world’s population, according to the U.S. Census Bureau’s International Database. Roughly 1.8 billion people worldwide are considered Millennials. In June 2015, the U.S. Census Bureau announced that Millennials outnumbered Baby Boomers. The number of Millennials means a lot of purchasing power is up for grabs. In a survey by Accenture, Millennial shoppers spend an estimated $600 billion each year, and by 2020 that amount is expected to grow to $1.4 trillion, or 30% of total retail sales. Millennials are also the first truly digital generation. According to the Total Retail 2016 report by PwC (PricewaterhouseCoopers), Millennials are online even when they’re in the store. The survey included 23,000 online shoppers from around the world. Of the 73% of respondents who said they go online while in a brick-and-mortar location, 42% were Millennials. All other age groups made up the remaining 31%. 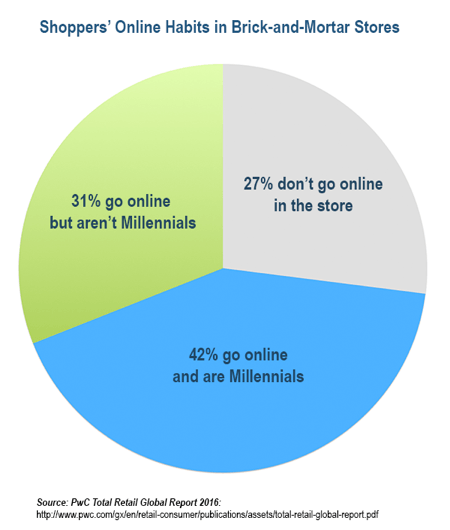 Millennials are much more likely to go online in stores than all other groups of shoppers. Just when marketers get used to the types of ads and content that perform best on a particular social network, the user base seems to shift, possibly requiring rethinking content strategies. According to one survey, social network use will remain fairly stable. Where the survey predicts changes, you see social networks adding new features. An RBC Capital Markets social media survey showed that in the last year, an average of 33% of Millennials who took the survey increased the time they spent on Facebook, whereas an average of 23.5% decreased their time on Facebook. The survey predicts that over the next year, only 17% will increase their usage and an average of 19% will decrease their usage. On average, 63.5% of Millennial respondents plan to use the social network for the same length of time as they have in the past. For marketers, this prediction could mean that the same audience is likely to see the same social network ads and branded content, leading to better brand awareness and recall. 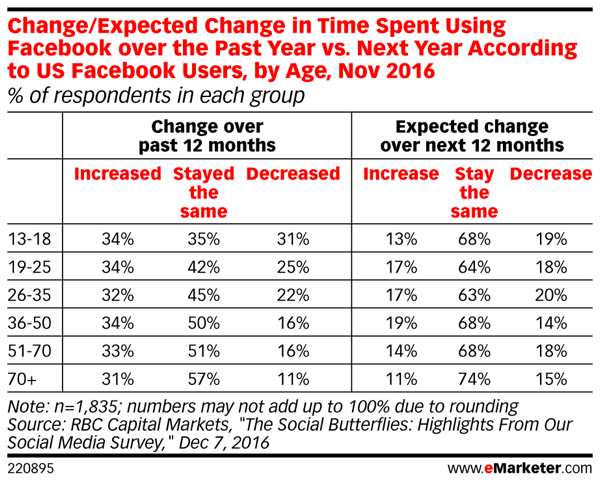 Facebook’s user base will spend the same amount of time on the social network in 2017. Why are most people planning to spend the same amount of time on Facebook in the coming year? Here’s one possible reason: Facebook has significantly slowed the development of flashy features that usually increase its user base. Arguably, Facebook Live, launched in 2015, was the last major addition. For time spent in the past year, Instagram’s numbers are similar to Facebook’s. On average, 36.5% of Millennial respondents increased usage, 40% use Instagram the same length of time, and 24% decreased their time on Instagram. This similarity isn’t too surprising because Facebook owns the image-only social network. 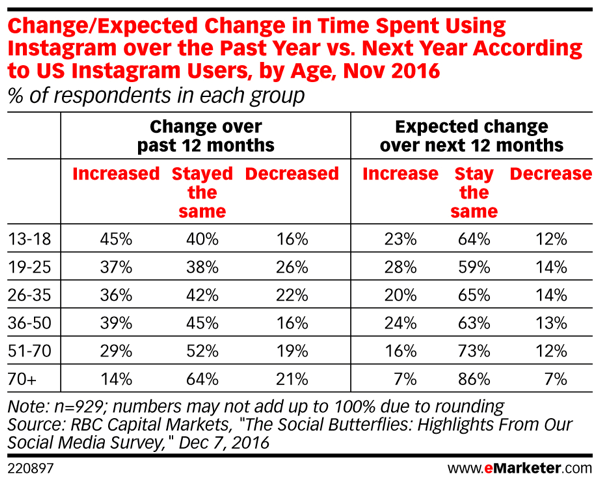 However, compared to Facebook, more Millennial users plan to increase their use of Instagram in the next year. On average, 24% state they’ll use Instagram more and fewer (14%) plan to decrease their usage. A quarter of Millennials plan to increase time spent on Instagram. While Facebook’s feature set has largely remained the same, Instagram added new features at the end of 2016, including live video and Instagram Direct (the app’s answer to Snapchat). With the surging popularity of both Periscope and Snapchat, Instagram was wise to broaden the app’s services, which are likely the reason more Millennials plan to use the service in 2017. RBC Capital Markets’ survey also covered Twitter. The results show that although a decent number of Millennials increased their Twitter usage in the last year, their usage will level off in the coming year. 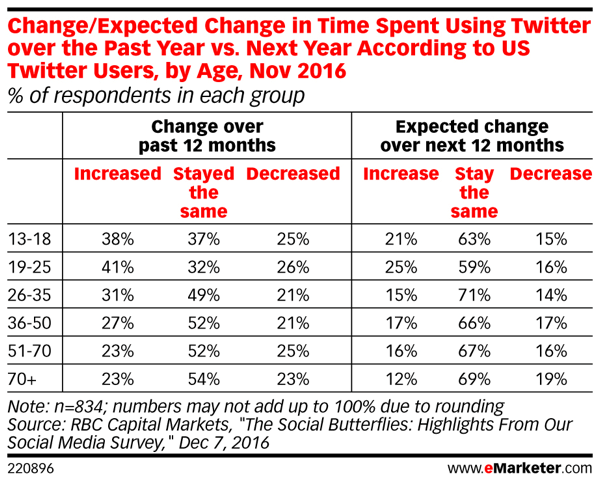 On average, 65% of Millennial respondents say their time on Twitter will remain the same and only about 15% say they’ll decrease usage. The time Millennials spend on Twitter is predicted to remain the same. Based on the RBC Capital Markets survey, Snapchat use increased the most among the four social networks. On average, 45.5% of Millennial respondents said they increased the time they spent on the app. Interestingly, Snapchat is in second place (behind Facebook) for the lowest percentage of people planning to spend more time on the app this year. Why? Perhaps it’s because Snapchat is a bit of a one-trick pony. Snapchat today is very much like the Snapchat of five years ago. The additions to the app are minimal: new filters, the ability to edit your snaps a little more, and group chats. Facebook took about 13 years to slow the development of new features, but Snapchat seems to have reached the same point in about half the time. Snapchat usage isn’t expected to increase in 2017. The best predictor of future behavior is past behavior. Social media professionals must know not only where their audience currently hangs out online, but also where they used to spend time and where they may be headed next. Put another way, keeping an eye on past trends may help you stay ahead of the curve when the tide turns, which always happens in social media. Keep an eye out for social networks that are adding new features and think about whom those features would benefit the most. If you hear about an update that will interest your target audience, you might prepare by ramping up your advertising and content strategy on that network. In other words, try to be proactive instead of reactive. It’s no secret that the average consumer, at best, tolerates digital ads. Marketers and advertisers put so much thought and effort into providing relevant information; however, consumers usually consider social media ads to be a necessary evil. How bad is it? 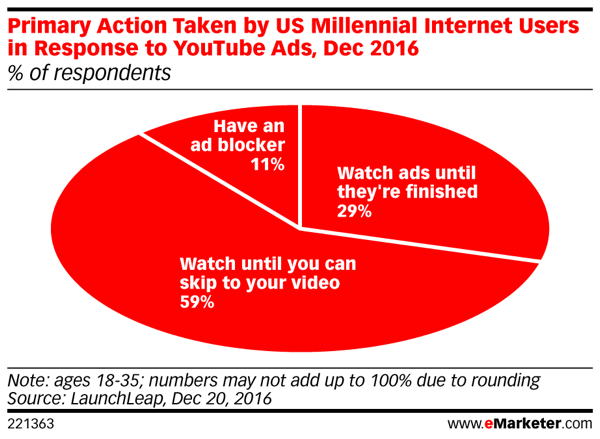 According to the recent LaunchLeap Internet survey of Millennials, 59% watch YouTube ads only until they can skip them, and 11% have an ad blocker. In other words, 70% of respondents don’t fully view the ads that marketers spend a lot of money to create and place on YouTube. Millennials avoid viewing video ads on YouTube. How much money is spent on ads that most Millennials ignore? eMarketer forecasts YouTube’s net U.S. video ad revenues will hit nearly $2.6 billion in 2017, accounting for 20.0% of total U.S. video ad revenues this year. However, the news isn’t all bad. 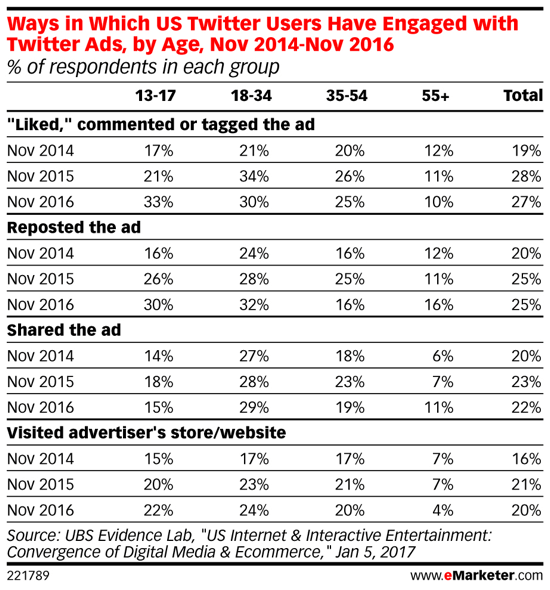 UBS Evidence Lab, in their report titled “US Internet & Interactive Entertainment: Convergence of Digital Media & Ecommerce,” showed Millennials have become slightly more accepting of Twitter advertising over the last three years. The percentage of people who reposted or shared the ad or visited the advertiser’s website has grown year over year. These numbers all cover around a third of 2,000 respondents and suggest that marketers are slowly but surely discovering what catches the attention of Twitter users. Among Millennials, Twitter ads are becoming more popular over time. 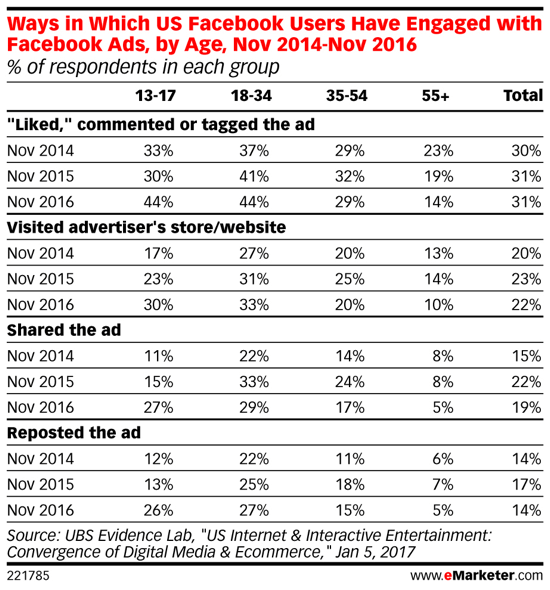 In the same survey, the number of Millennials who interact with Facebook ads has continued to rise as well. The exception is sharing the ad, which has fallen steadily since 2014. Regardless, the average of all interactions still hovers around 32% to 33%. These two examples correlate with the findings of the LaunchLeap survey that found around 30% of people sit through the entire YouTube ad. Millennials take more interest in Facebook ads over time. Do these survey results mean that social media marketers are destined to waste advertising dollars on digital ads that no one pays attention to? Not necessarily. Millennials aren’t adverse to marketing messages, but only if those messages are delivered in the right format. These days, the preferred formats are content marketing and influencer marketing. The secret to marketing to Millennials is not to market to them; not directly, anyway. It’s the old “sell without selling” idea. When Millennials look for product and service recommendations, they’re more likely to consult trusted sources such as family, friends, or their favorite social influencer. In your content marketing, give Millennials something for their time, attention, and (hopefully) loyalty. They’re more likely to trust your brand if you show a genuine interest in educating them with a how-to, for example. Your brand awareness can still increase, even if you’re not overtly selling. Millennials are looking for value, whether real or perceived. Marketers have done a good job marketing to Millennials, who are one of the most unique and discerning audiences on the Internet. As time passes, however, social media advertising, like TV and radio advertising, may become more like background noise. For both social networks and advertisers to attract Millennials, they need to offer valuable content, whether that’s new features or useful information. What do you think? Does your audience include Millennials? How does your experience marketing on these social networks compare with the results of these surveys? Please share your thoughts in the comments.